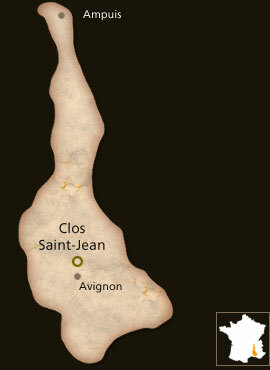 Clos Saint-Jean is a family estate that was established in 1900 by Edmond Tacussel. The domaine began bottling wines in 1910 and has expanded over the generations. 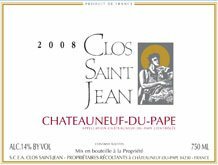 Saint Jean symbolizes life, and is thus associated with fertile lands yielding quality foods. Pascal and Vincent Maurel have been heading the estate since 1991, and oenologist Philippe Gambie has been assisting since 2003. At Clos Saint-Jean, we operate under the principle that complete respect for the land and the environment are essential to achieving a great wine. The property covers 43 ha situated at lieu-dit La Crau. 40 ha AOC Châteauneuf-du-Pape red. 20 ha of which are on the renowned plateau of la Crau. 1ha AOC Châteauneuf-du-Pape white. We cultivate the soil by the most natural means for our terrain. The use of insecticides is limited and the use of phytosanitary products even more so. We practice ébourgeonnage on the entire vineyard as well as green harvesting, which directly bears upon the yield and improves the overall quality of the grapes and of the wine. Finally, complete respect for the land and the environment are essential to achieving a great wine. The 2015 Châteauneuf du Pape Blanc is a step up over the 2014 and offers terrific notes of stone fruits, pears and apple blossom in a medium to full-bodied, fresh, lengthy and elegant style. Coming from an old vine selection and a smaller production release for the US market, the 2015 Châteauneuf-du-Pape Vieilles Vignes tastes like the classic cuvée, only on steroids. Kirsch, loads of black and blue fruits, flowers and lavender notes all emerge from this full-bodied 2015 that has fine, fine tannin, solid mid-palate depth and a great finish. It certainly offers pleasure today, yet will keep for 10-15 years. 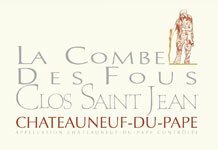 The 2015 Châteauneuf-du-Pape Combe des Fous shows the seamless, silky side to the vintage, and has closed down slightly since I tasted it from barrel. Its big, intense nose of black cherries, blueberries, white chocolate, and garrigue gives way to a full-bodied, plush, gorgeously layered 2015 that will benefit from 2-4 years of cellaring. From a parcel with 60% Grenache (planted 1905-10), 20% Syrah, 10% Cinsault and 10% Vaccarese. Yield 20 hl./ha. The name Hill of Fools, refers to what people said when Tacussel planted vines at that parcel — it was foolish to work in such big stones. 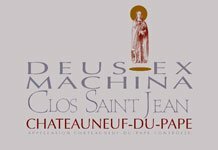 One of the gems of the vintage is the 2015 Châteauneuf-du-Pape Deus Ex Machina which is as always, a 60/40 split of Grenache and Mourvèdre. It offers sensational notes of blackberries, ground herbs, white chocolate and an undeniable meatiness (It reminds me of a butcher shop from the south of France) that develops with time in the glass. Full-bodied, perfumed, complex, elegant and layered, it doesn’t have the density of the 2016, 2010 or 2007, yet is seamless. Give bottles 4-5 years and enjoy over the following 15+. 60% Grenache and 40% Mourvedre. 20 hl/ha. The name refers to how the Gods in antique tragedies were coming per high machines into the scene.